Cumin seeds or, jeeren as the people of Goa call them, are one of the essential spices in many Indian and Goan dishes. The yellowish brown seed has a nutty taste with a touch of pepper. It belongs to the Apiaceae family like anise and fennel, hence the similarity in structure. Goans have a dish called jeeren-meeren which is made mainly with cumin seeds and pepper and is quite delicious. 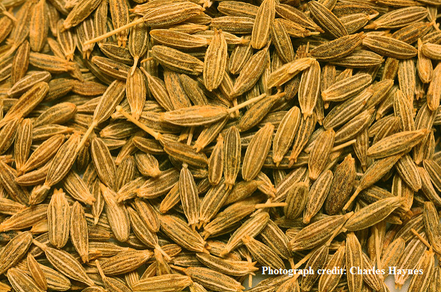 Cumin seeds can help in improving digestion due to the presence of essential oils. Cumin tea can help resolve problems of indigestion, flatulence and stomach pain. Its high fibre content makes it a good laxative. The healing quality (antifungal and antimicrobial) of cumin allows it to soothe the problem of piles. It acts as a relaxant and can help people suffering from insomnia. The high content of iron in cumin allows it to boost immunity. Cumin’s anti-inflammatory and antibacterial properties make it an excellent home remedy ingredient for cough and cold. It has a considerable amount of potassium which can regulate heart rate and blood pressure, making cumin a welcome addition to the diet of heart patients. Drinking a glass of cumin or jeera water in the morning would prove beneficial to such patients. Cumin may have anti-cancer and anti-diabetic properties. Ingredients: 1.5/2 kg chicken cut into medium to large pieces, one large onion, one chicken Maggi cube, 18-20 black olives (preserved), 18-20 capers in vinegar, 2 tsp of mixed herbs, 3 tbsp of wheat flour, 1 tbsp of ginger-garlic paste, 150 ml of thick milk cream, 250 gm of button mushrooms, salt (to taste), ½ tsp of pepper, 2 tbsp of oil, and half a cup of water. Preparation: Sauté the chopped onion till translucent and then add the ginger-garlic paste and mushrooms. Stir and cook till mushrooms soften a bit. Mix the chicken Maggi cube, wheat flour, salt and pepper and mixed herbs and cover the chicken pieces with this mixture. Then fry the chicken pieces till they turn golden brown. 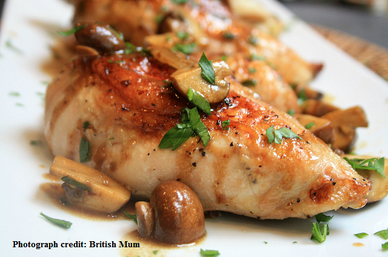 Put the cooked mushrooms in a non-stick oven dish and place the chicken pieces in it too. Add capers, olives and water to the dish and bake for 20 minutes in the oven at 200 °C. After 20 minutes, remove the dish and mix the cream in and return to oven to cook for another 10 minutes. Ingredients: 7-8 apples, ¼ tsp clove powder, ¼ tsp cinnamon powder, 100 gm of cold butter, 100 gm of wheat flour, 100 gm of oats, 100 gm of demerara sugar/ordinary sugar, and water. Preparation: Peel and core the apples. Half and slice them, and boil them in water with 50 gm of sugar, cinnamon and clove powder (first bring to a boil and then simmer for about 15-20 minutes) till the apples are soft. To prepare the crumble, cut cold butter into cubes and hand mix with the remaining 50 gm of sugar, the oats and the wheat flour. This will form a crumbly mixture. 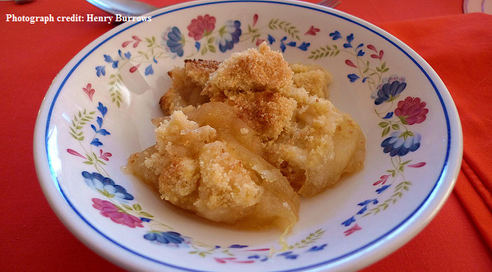 Drain the apple slices, place them in the oven dish and cover evenly with crumble. Place dish in oven that has been preheated at 200 °C and bake for 20 minutes at 180 °C. Serve with vanilla/butterscotch ice cream. Half a lime squeezed in a glass of warm water should be taken every morning to get rid of stomach fat. Do this on an empty stomach and avoid eating for the next 30 minutes. Include cinnamon powder in its uncooked form in your diet every day (1 tsp per day) by sprinkling it over toast, coffee, cereal, etc, for increased metabolism to burn fat. Boiling ginger in water (one inch of ginger for 4 glasses of water) and consuming the decoction with the juice of half a lime and 2 tsp of honey will also stimulate your metabolism to lose belly fat.